Friday, November 21st, 2014 was a BIG day for Nintendo fans here in the US. In addition to Pokemon Omega Ruby and Alpha Sapphire releasing on the Nintendo 3DS, Super Smash Bros. released for the Wii U. Right along side the "smash hit" (no pun intended) were the Amiibo. 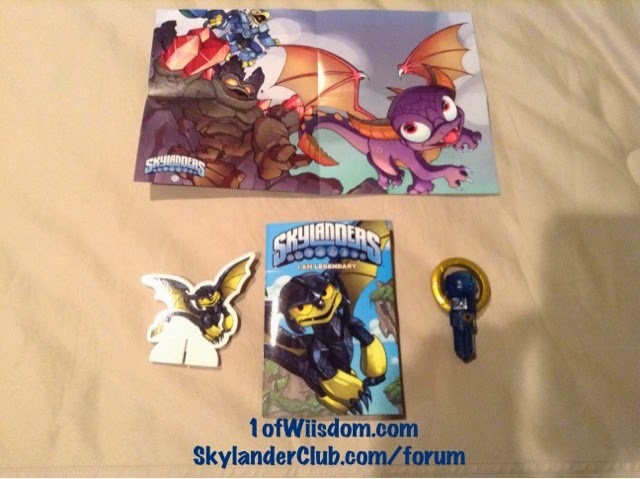 Amiibo figures are similar to Skylanders...They are cool, collectible, and function in-game. While Skylanders work in Skylander games, Amiibo will be able to hop titles within the Nintendo framework. Obviously, not all games will integrate Amiibo, some functionality will be minimal, most will fail in comparison to the content rich Smash Bros., but nonetheless it is a selling point. The Amiibo figures work with NFC (Near Field Communication). That funky looking gray rectangle on the Left Hand side of your game pad that seemed like wasted real estate...It is the NFC pad. You use it to scan Amiibo into the respective games. It works just like the Portal of Power in Skylanders. The 3DS lacks this NFC pad and will have a peripheral device released at a later date to allot for Amiibo functionality on 3DS titles. To cliff note that, the Amiibo look cool and offer in game functionality via NFC. See, simple. As of right now there are 29 Amiibo slated for release. There have been no "Chase" or Special Edition made known at this point, although in a Twitter Q&A Nintendo would not discuss the possibility either way. At this point in time, these figures will drop in 3 Waves. Wave 1: Friday, November 21st, 2014. All Amiibo have an MSRP of $12.99. --All Amiibo (as of this writing) are supported in Super Smash Bros.
Skylanders Trap Team: Trap And Play Sweepstakes! 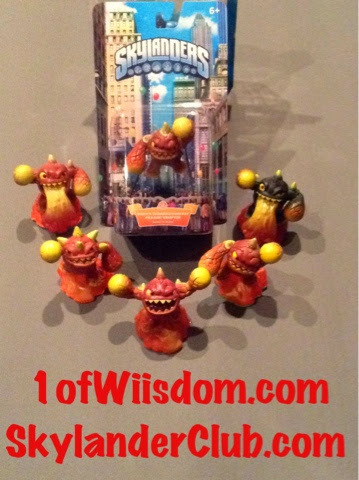 Portal Masters Rewarded for Showing How They Trap and Play as Villains in Skylanders® Trap Team Anytime, Anywhere! 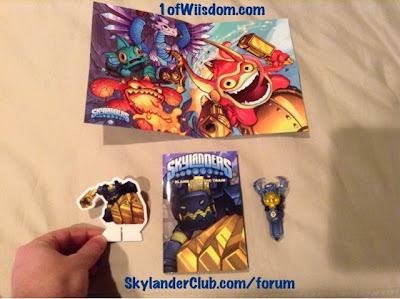 SANTA MONICA, Calif. - Nov. 20, 2014 - Portal Masters can show their love for trapping and playing as villains in Skylanders Trap Team via the #TrapAndPlaySweeps photo and video sharing sweepstakes starting today. Activision Publishing, Inc., a wholly owned subsidiary of Activision Blizzard, Inc. (NASDAQ: ATVI), recently announced that for the first time a full Skylanders® game is compatible with the latest iPad®, Kindle Fire and Android tablets, and now Skylanders Trap Team starter packs are available at Apple® retail stores nationwide and the Apple Online Store (http://www.apple.com), making it easier for fans to experience the magic of Skylands on iPad. To celebrate Portal Masters' ability to play Skylanders Trap Team anytime, anywhere, Activision, the innovator of the award-winning, $2 billion Skylanders videogame franchise, has launched the three-week sweepstakes for fans. With the #TrapAndPlaySweeps, players can show their excitement for Skylanders by tweeting photos or video of themselves playing Skylanders Trap Team to the official Skylanders Twitter channel (@SkylandersGame) using #TrapAndPlaySweeps #Skylanders for the chance to win cool prizes from November 20 through December 11. Skylanders Trap Team on tablet delivers the same game experience with console-quality graphics(1) and comes with its own high performance controller, delivering yet another significant technological leap for the Skylanders franchise. In the game, Portal Masters seek out and defeat the most wanted villains in all of Skylands, pulling them out of the game and into living rooms by capturing them in magical Traps. Players can then send villains back into the game where they play as them to fight for good. "The arrival of Skylanders Trap Team in Apple retail stores nationwide and the Apple Online Store marks a momentous milestone for the Skylanders franchise," said Josh Taub, senior vice president of Product Management at Activision Publishing, Inc. "We're thrilled that anyone who gets a new iPad this holiday season will have the ability to experience the magic of the complete Skylanders game whenever, wherever they want." 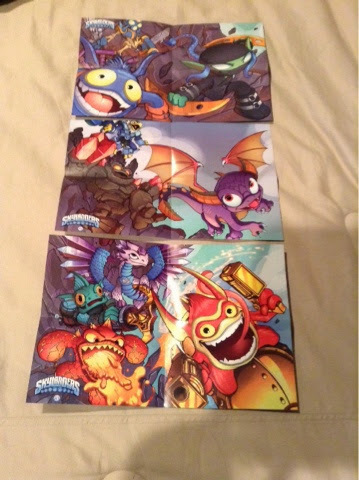 With a 90 Metacritic review score for iPad, Skylanders Trap Team is compatible with third and fourth generation iPads -- the iPad mini Retina, the iPad Air and the brand new iPad Air 2 and iPad mini 3 -- all offering unmatched portability and high quality graphics that create an immersive, mobile experience like no other. Skylanders Trap Team is playable with more than 175 unique toys from all previous games - Skylanders® SWAP Force™, Skylanders® Giants and Skylanders® Spyro's Adventure. Every character is able to defeat and trap villains using Traptanium™ Traps, providing fans more ways to enjoy their collections. The game is available on the following platforms: Nintendo's Wii™ system and Nintendo's Wii U™ system; a variety of iPads®, Kindle Fire and Android tablets; Xbox One and Xbox 360 games and entertainment systems from Microsoft; PlayStation® 3 and PlayStation® 4 computer entertainment systems from Sony. A different adventure is also available on the Nintendo 3DS™ hand-held system. 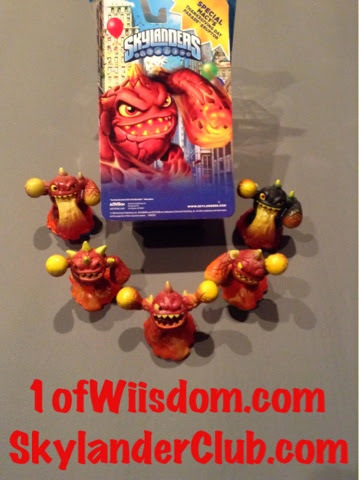 A free introduction of Skylanders Trap Team is available on the App Store for iPad or at http://www.AppStore.com. 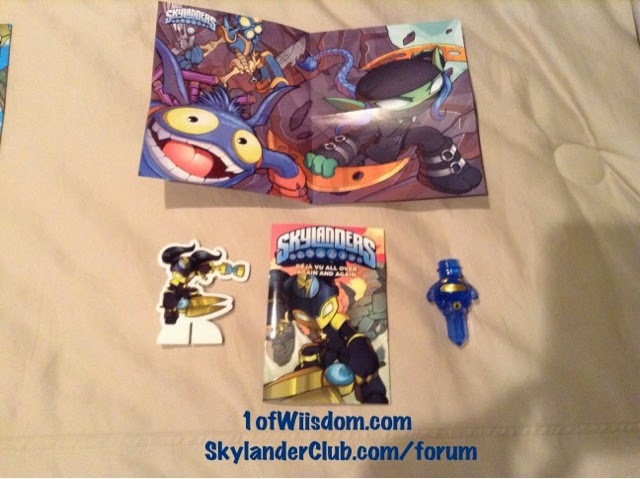 Also of note, for those of you with an Apple Store nearby, Skylanders Trap Team's Tablet Starter Pack will be getting SHELF SPACE in the store. This is quite the accomplishment as things are usually kept first party at Apple Stores. If you've got a store nearby, check it out! Here is an update to an older post where I outlined the 2 DLC Packs for Mario Kart 8! Why the update? DLC Pack 1 hits Thursday, November 13th, 2014! 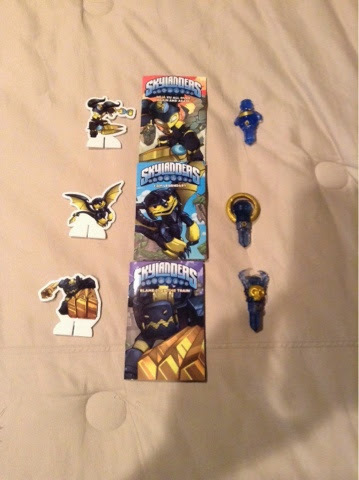 If you thought Eruptor was hot headed, wait until you see this! Skylanders is taking Eruptor to new heights as a brand new balloon in the Macy's Thanksgiving Day Parade! 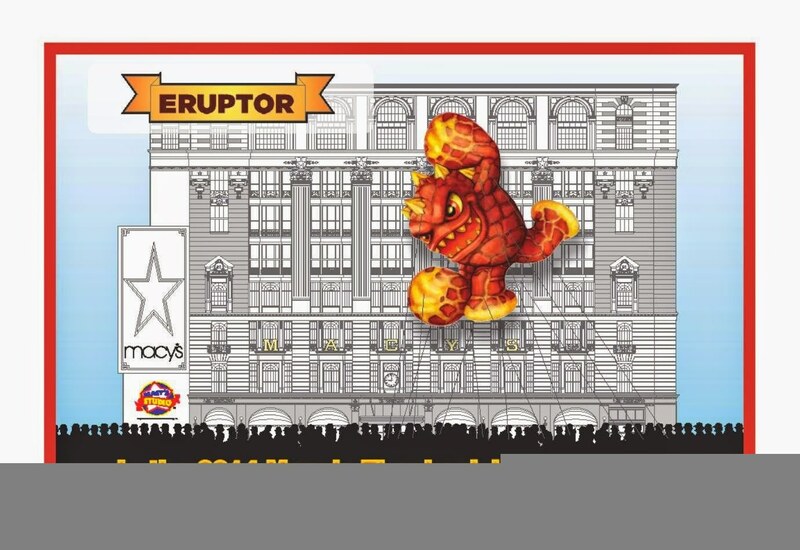 Here is a rendering of how Eruptor will look parading down the streets! And now, an 11/24 Update: Here is a BEHIND THE SCENES TRAILER! SKYLANDERS MAKES DEBUT IN MACY'S THANKSGIVING DAY PARADE! Skylanders, the popular kids video game that brings physical toys to life, is taking flight in the Macy's Thanksgiving Day Parade for the first time! Fan-favorite Skylanders character Eruptor will join the prestigious collection of balloons at the parade, marking a significant pop culture milestone for the franchise. 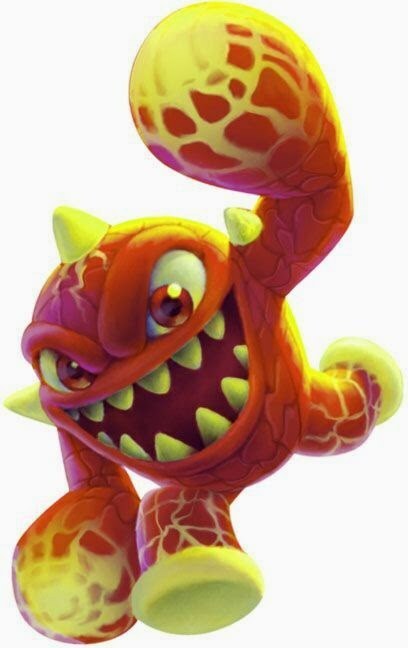 Fan-favorite character Eruptor, who will be flying high above the New York City skyline, hails from deep in the underground of a floating volcanic island that launched his entire civilization to the surface after a massive eruption. He's a complete hot head - steaming, fuming, and quite literally erupting over almost anything. In fact, to re-create Eruptor's smoldering physique, artists used more than 40 gallons of florescent paint and five barrels of glitter! 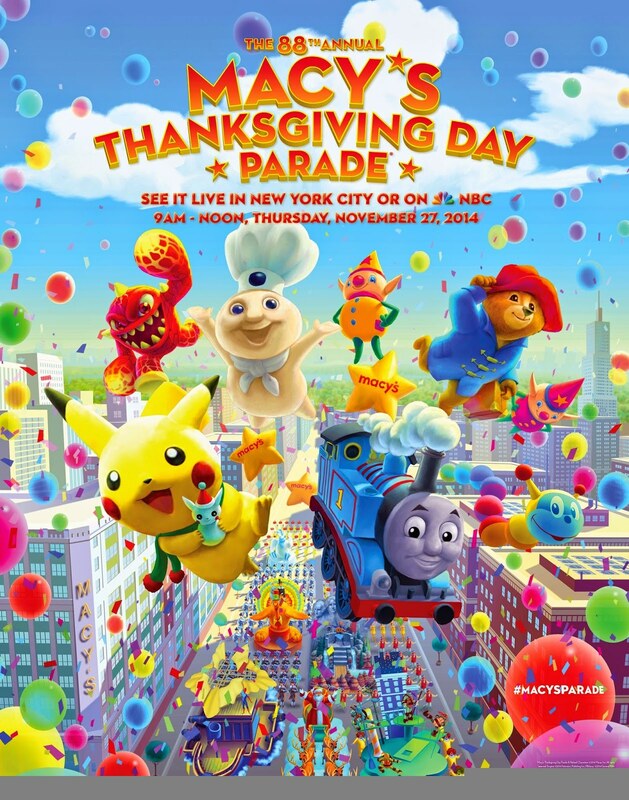 The live broadcast of the Macy's Thanksgiving Day Parade will begin at 9 a.m. all time zones on NBC. A sneak peak of the Eruptor balloon can be viewed via the attached graphical render.